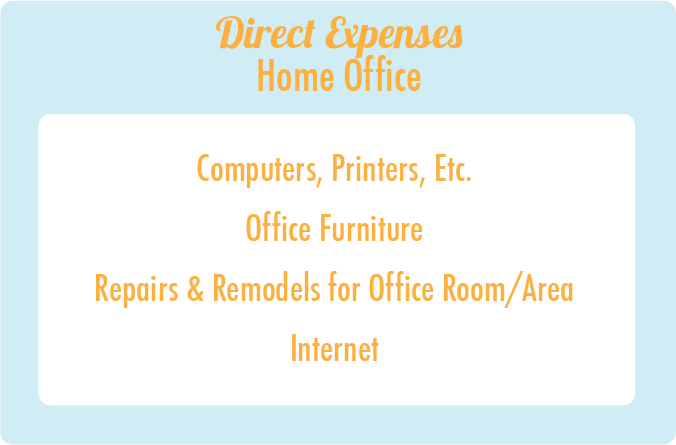 Home Office : Personal vs. Business Expenses? 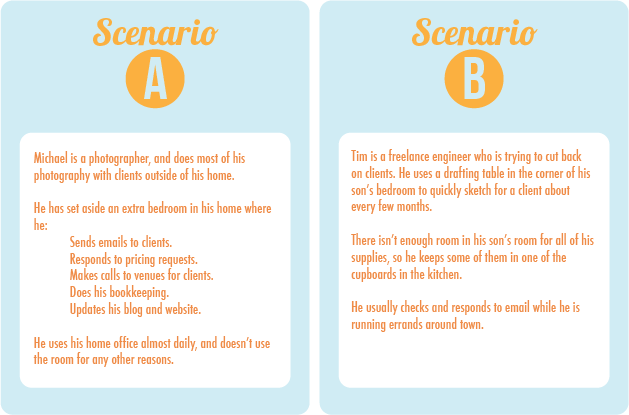 Many small business owners run their operations from home--just like you. You're trying to save costs wherever you can, and it's a no-brainer to use your home as a homebase rather than forking out the cash to lease a pretty loft space (although that would be rad!). It's a simple solution. However, when it comes to deducting expenses for your home, the lines can become a little blurred. 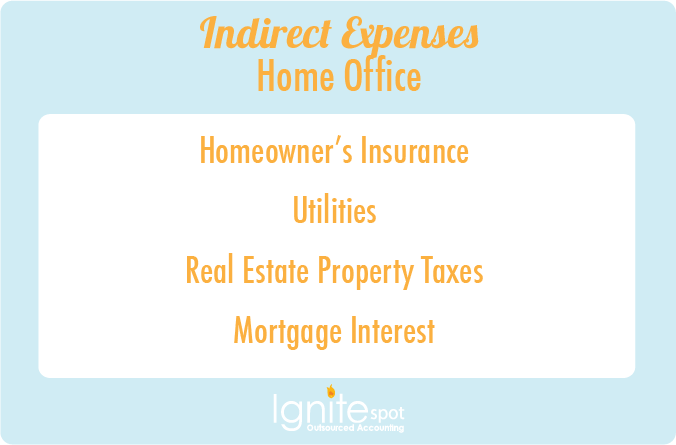 Do you know the difference between direct and indirect expenses, for example? The IRS doesn't always make it simple to figure out what are personal vs. business expenses when it comes to taxes. So we're here to give you essentials in a language that you can easily understand. 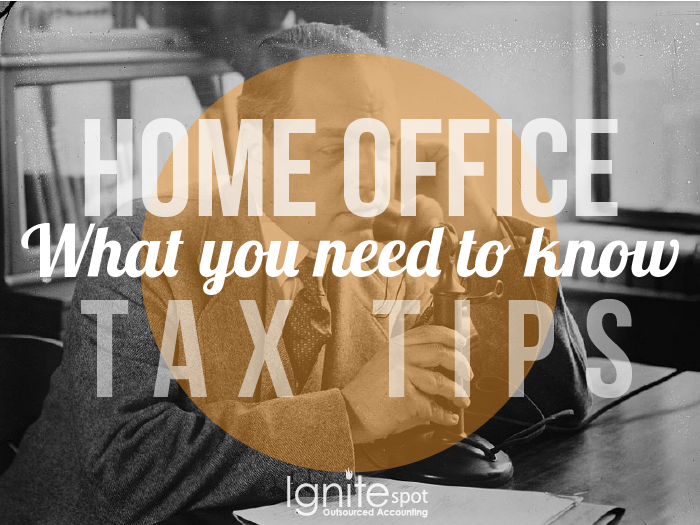 You have probably heard the terms "Regular" and "Exclusive" use when it comes to home office taxes. If your home office is used regularly and exclusively for trade or business purposes then it's definitely a business expense that can be deducted. 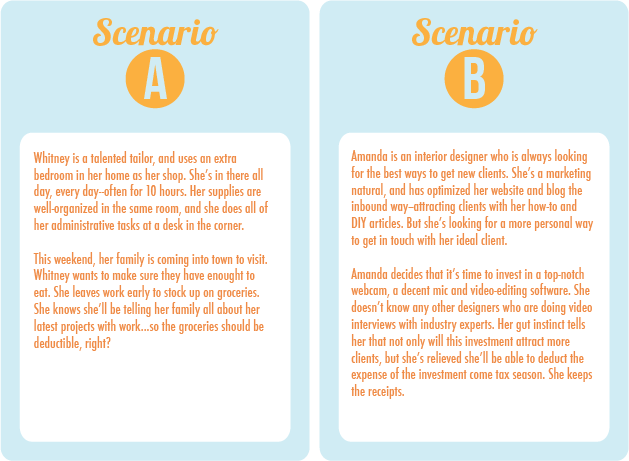 Which scenario do you think qualifies for regular and exclusive use? He works in his son's bedroom--not very "exclusive," is it? His supplies are scattered throughout the home, which makes figuring square footage almost impossible. He completes managerial and administrative tasks (via mobile) elsewhere. It's going to be very difficult for Tim to convince the IRS that he is eligible to deduct home office expenses. 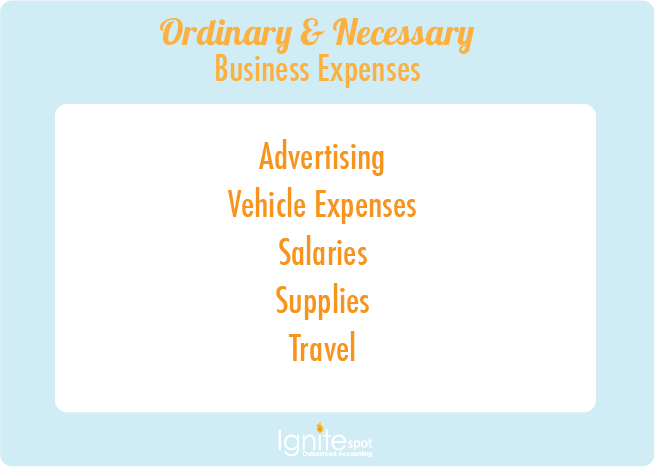 Business Expenses Are "Ordinary & Necessary"
Is it an ordinary expense for me and others in my line of work? 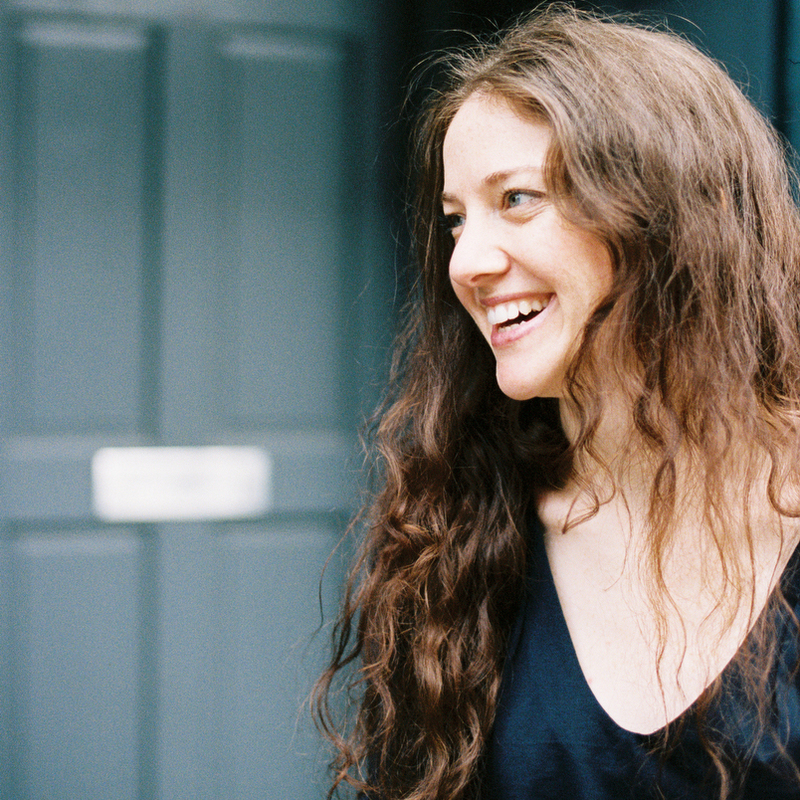 Is it necessary for me to conduct business? Sorry, Whitney. Those groceries are not ordinary or necessary for your tailoring business. If you were hosting clients over the weekend rather than family members, then you could totally deduct those expenses. But, it's your family--even though you talk shop with them, it's probably not necessary. This expense is definitely personal. Amanda is on the right track. Maybe other designers aren't investing in the same equipment as she is, but other marketers in other industries are. It's definitely an ordinary marketing investment. And it so happens that marketing is a necessary expense for any business. Deduct away, Amanda! These expenses are fully deductible (unless subject to limits), and are only for the business part of the home (the part that is used regularly and exclusively for trade or business). 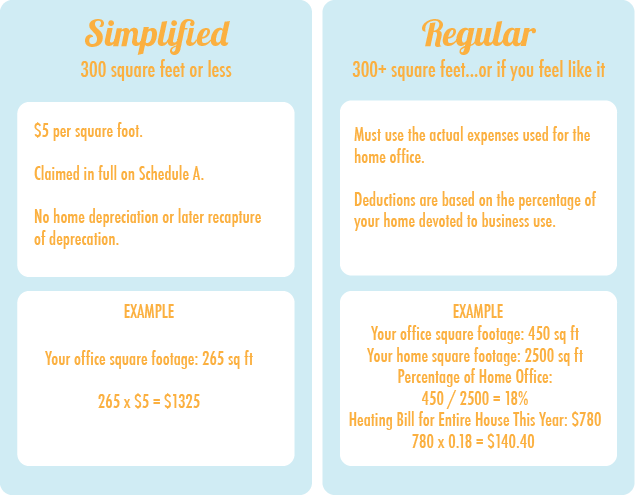 These are the expenses needed to run the home, and are deductible based on the percentage of your home used for business purposes (there may be deduction limits). Starting in 2013, the IRS offers a Simplified Method for deducting your home office--if your home office is 300 square feet or less. If your home office is more than 300 square feet you must deduct your home office using the Regular Method. You do not have to use the simplified method, but it's pretty slick. 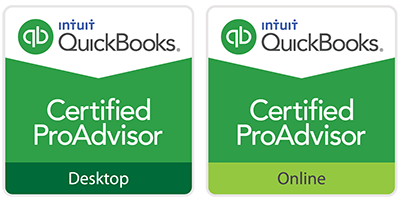 The simplified method significantly reduces your record keeping burden, and saves you time come tax season. Still have questions? One of our CPA's will give you 30 minutes of their time FREE. Just click below to schedule an appointment.